Served in fresh burger buns, these homemade cheeseburgers are made with Parmesan cheese and barbecue sauce. 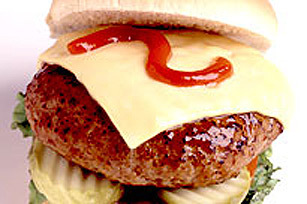 Brushing with additional sauce while grilling ensures a juicy beef burger each and every time. COMBINE with beef and shape into patties. BARBECUE until done, brush with additional barbecue sauce. Top each patty with a cheese slice. Garnish as desired.